Mariano Rajon, pictured above is the leader of Spains Popular Party. 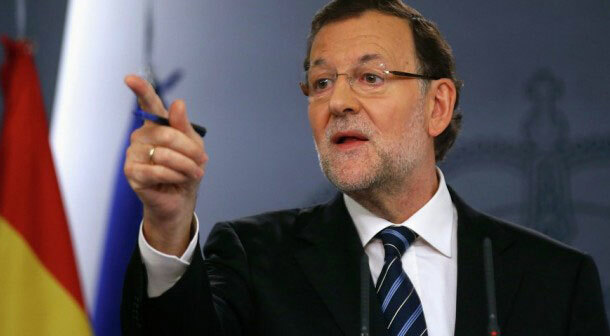 On Sunday evening Spain’s ruling Popular Party lost its parliamentary majority in elections meaning Prime Minister Mariano Rajoy may well be the third European leader to be ousted this year after pushing forward unpopular austerity policies. With the majority of votes counted, the Popular Party (PP) had 123 seats; the Socialists 90 and the anti-austerity Podemos party 69. The liberal Ciudadanos party was in fourth place with 40 seats. It is now thought that the elections are likely to force the Spanish prime minister to begin negotiations in order to remain in office by forming either a minority or coalition government. Prime Minister Mariano Rajoy’s party required 176 seats to form a majority. Spain, which returned from recession in 2013 following major belt-tightening measures and labor reforms, is now seeing growth of around 3% this year, which is the fastest rate among major eurozone economies. The country however is still dealing with its unemployment rate of more than 20% which has only slightly improved since 2011 when Mr. Rajoy took office. On Sunday roughly half of Spain’s electorate voted for parties which rejected the austerity measures Mr. Rajoy put in place to halt the country from becoming insolvent. The parties included the Socialists and Podemos, who pledged to restore funding slashed from social welfare and education programs. Ciudadanos said it would address cronyism in government, and restructure the education system and labour market. The Socialists failed to get away from their legacy of leading Spain into recession and soaring joblessness when previously in office. The party has also been involved in allegations of corruption which include a court investigation into the embezzlement of public funds set aside for the unemployed. Sunday’s election in Spain was not the first to end in a hung parliament. In nine of the previous elections four of the first-place parties fell short of a majority. In each case, the winner took power as either a minority government or in a coalition with regional parties.